Every day new patients are admitted and released from hospitals. Each with their own unique medical story. Most hospitals do their best to make a patient’s treatment and stay a positive, healthy experience. But that doesn’t always happen. Most people have heard of the horror stories associated with hospital risks — dangers of medical complications and infections, incorrect prescriptions or dosage, operations on the wrong part of the body; the list goes on. 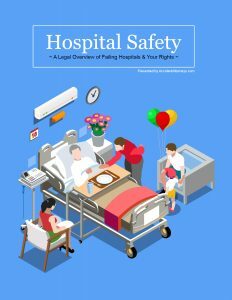 If you or your loved one are in a hospital or will be admitted soon, take some time to educate yourself about basic hospital safety with our free Hospital Safety eBook. Our attorneys and safety advocates have seen all kinds of medical malpractice. That’s why our free guidebook also includes the most recent list of failing hospitals in the country and information to help get you started if you need legal help. Download your free Hospital Safety eBook now.